Sacculina is a parasitic arthropod from a crustacean subtype. The process of its development can serve as an excellent plot for a horror movie. The larva of the female parasite (which looks so innocent), travels for some time in the water column in search of suitable “prey” (nauplius stage). After 4-5 days, a small chitinous shell begins to appear in it (cypris stage). From this point on, sacculina has only one goal – to find a suitable crab as soon as possible, to gain a foothold on it and develop further. When the cypris-shaped larva finds a suitable candidate for its temporary shelter, it moves on it until it finds a suitable place. It is well attached and pierces the integument of the crab with a sharp and durable spike located on the head. And then, literally, it throws off the trunk, limbs and conch, and “injects” the head, in the form of soft mass, into the body of the crab. The next stage of development – endoparasitic – begins from this moment. Sacculina (more precisely, what is left of it) grows through the body of the crab and becomes a shapeless lump of processes. It begins to feed on the crab’s nutrients and subordinates its behavior. As a result, the crab turns into a live puppet. But the crab was not destined to die quickly, on the contrary, an infected crab begins to live longer than its “healthy” fellows. 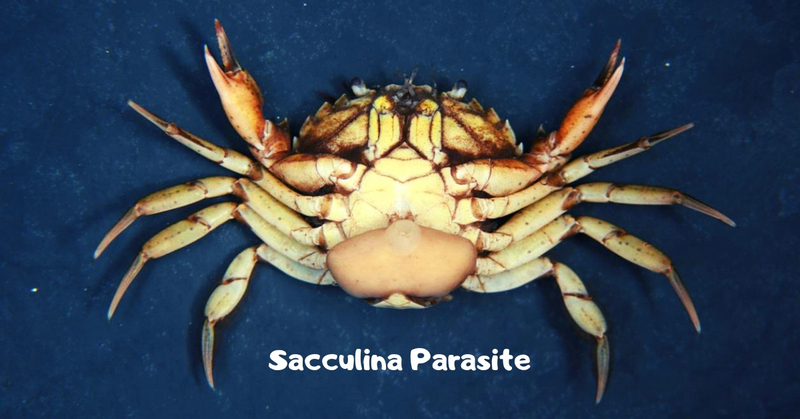 The early death of a crab is not beneficial to the parasite. Gradually growing inside, the processes of Sacculina reach almost all organs, especially reproductive organs. The parasite destroys them. Such castration is performed with only one purpose – it is necessary to save the energy of the crab to produce its own offspring. This “operation” leads to a change in the hormonal background in males. They gradually begin to behave like females, so in addition to this, their belly expands and smoothes. After that, the crab stops shedding. After some time, the parasite inside the crab begins to crawl out and forms a bag-shaped form. Some of its processes are still distributed throughout the body. The males of Sacculina do not parasitize. They look for matured females on the abdomen of crabs, enter into it and fertilize its eggs. When they mature, the crab begins to take care of the future offspring of the parasite as if it were not an alien creature, but its offspring. Later, many free-floating larvae hatch from eggs and everything starts in a new circle.